About one in ten of the population are described as "somnambulists". These are people who are very susceptible to Hypnosis and so to Hypnotherapy. The down side is that these people seem to be more prone to certain kinds of problems in the first place, simply because they are so suggestible. If you are or were prone to sleepwalking,or sleep talking, even as a child, then you are likely to be in this group. What happens next is dependent upon the nature of the problem the individual. However, the first session normally concentrates upon learning how to relax properly in hypnosis. We may also begin learning how to do self-hypnosis, where you can put yourself into a hypnotic sleep whenever you feel stressed, etc. Naturally, many clients feel a bit apprehensive before the first session and they tend to stay in a fairly light level of hypnosis. Some clients are desperate for relief, however there's no point in trying to do anything requiring a deep level of hypnosis in the first session, because it probably wouldn't work! There is no sense in having a client feel that somehow he or she has failed or feeling that "it doesn't work for me". I always tell clients not to expect big things from the first session - it is only the first session, after all! You will be asked to relax in a very comfortable reclining chair. I will play some soothing background music. All you have to do is to "half listen" to my voice and allow yourself to relax. You mustn't try to make anything happen, nor try to stop anything happening. Some people do this quite naturally, whilst others struggle a bit with the idea that you're not supposed to concentrate hard on what I'm saying; rather let me drone on in the background. Some people may feel, unconsciously, that they need to retain control, and initially resist going into deeper hypnosis. This is perfectly normal, and, once they discover that nothing unpleasant is going to happen, they simply "let go" and can then thoroughly enjoy the whole experience. For most people, this will be the most relaxed they have ever been! You will then receive treatment over the next five or six sessions. One major aspect of the treatment involves examining moments in your life where things happened that you've been trying not to think about. These memories are normally loaded with negative emotions such as anger, hurt, sadness, etc.The idea is to finally let these emotions out. For example, if someone made you angry, I want you to get angry. If something happened that hurt you, you let the tears come. Once these emotions are released, the relief can be immense. Very, very, occasionally, when people feel very emotional but try to hold it back instead of letting it out, they can get a headache. It's similar to the situation when you try not to cry at a funeral service, but then get a headache when you emerge into the daylight. Note that, if you do get a headache, it's nothing to worry about and it won't last too long. The benefit you will feel following completion of the course of treatment should make it all feel worth while. It is important to complete the treatment, otherwise you may be left with the memory of a previously repressed event, which has not been dealt with. 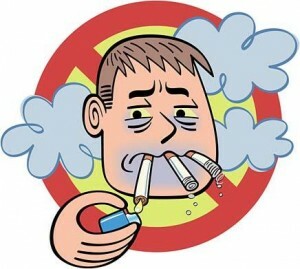 Smoker's treatment can occasionally be successful treated after only one or two sessions, if they are somnambulists. Usually though, there is a reason why they can't stop, other than simply the nicotine addiction. Scientists tell us that the addiction wears off after 21 days. When then do people start again after many months, or even years? Something else is going on the background. Beware "therapists" who guarantee to stop you smoking, etc., in a single session, or who gives you any type of guarantee of success in any treatment. If I really had a method that was guaranteed to stop people smoking - I'd be a multi-millionaire by now!! !